A variety of consequences may result from teen pregnancy, consequences that affect the teen herself, the baby’s father, the baby, and the extended families. 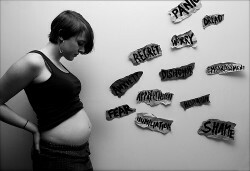 This article provides an overview of some of the main consequences of teen pregnancy. Many pregnant teens have to face the difficult situation of immediately making choices about their teenage pregnancy and education and future in light of someone else. Unlike other teens whose own future is their primary (and maybe only) focus, the pregnant teen has someone else to consider. Obviously, whether to continue the pregnancy is a question that may be asked, by someone, if not by the teen herself. If the teen, the baby’s father, their families, and their community (including any worshipping communities they may belong to) agree about this issue, she will likely have an easier time. According to teenage abortion statistics, there has been a decline in teens choosing to abort their babies. But even so, in a society that is sharply divided on the question of abortion, the teen may face enormous pressure to both continue and to end the pregnancy. It is also a decision that the teen and the baby’s father will have to live with. This decision itself, to say nothing of a baby, is a grave responsibility to take on for someone whose own education is probably not complete. Teens who decide to carry through with their pregnancies have further choices and arrangements to consider. Will they keep the baby or put it up for adoption? How will the baby be looked after? How will it be supported? How will their own education be completed? What role will the baby’s father play in all this? Should they get married? Pregnant teens are among the most likely mothers-to-be to have inadequate prenatal care. This may be the case because the teen is unaware of or trying to hide the pregnancy or if she does not have support. Because prenatal care includes screening for medical problems, nutritional information, and other care information, a teen lacking these things may suffer health effects herself and inadvertently cause health effects for her unborn child. Teens who are pregnant have a greater risk of having elevated blood-pressure (pregnancy-induced hypertension) than older women who become pregnant, as well as a greater risk of preeclampsia, a condition in which high blood pressure is accompanied by fluid retentions and which can be quite dangerous. Teens may also become anemic or depressed. Prenatal care can help address either condition. Teen mothers more often give birth prematurely, that is, prior to 37 weeks, and premature babies face increased risks for health problems, both short- and long-term. Among these are problems with vision, cognition, the the baby’s respiratory and digestive systems. The babies of teen mothers are also at higher risk for low-birth-weight. Low- birth-weight may or may not be due to prematurity. It seems that teen mothers are at greater risk for postpartum depression, according to the CDC. This is treatable, and knowing that it may happen may allow the symptoms to be recognized earlier. According to a report by the Robin Hood Foundation, only a third of teen mothers receive a high school diploma, suggesting that they will have fewer skills to secure employment. Teen fathers are likely to finish fewer years of school than older fathers do, as well as less likely to hold a steady job or earn enough to support their new family. Additionally, their children are more likely to perform poorly in school, while their daughters have a 22 percent greater risk of becoming teen mothers themselves. According to the National Campaign to Prevent Teen and Unplanned Pregnancies at least 75 percent of unmarried teen mothers end up going on welfare within 5 years of their first child’s birth. The children of unmarried teen mothers are more likely to drop out of high school and far more likely to live in poverty. Knowing about, discussing, and being proactive about the challenges involved in teenage pregnancy can itself make the process easier and more likely to have positive outcomes for all involved.